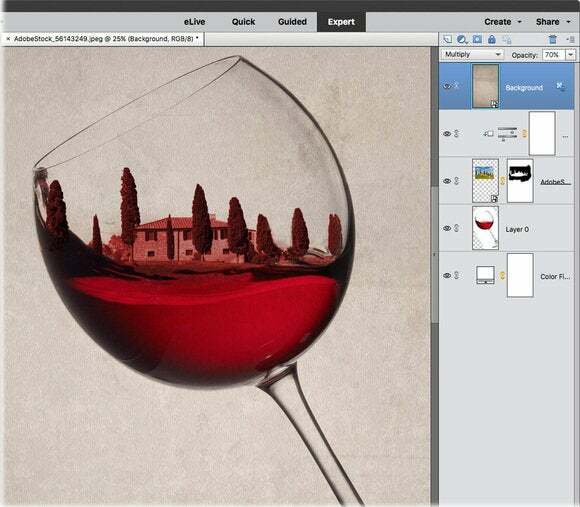 Learn how to use Photoshop Elements to combine photos to create a cool effect. 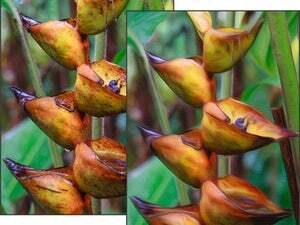 One of the most exciting projects you can tackle in image editing software that supports layering—Adobe Photoshop, Photoshop Elements, Pixelmator, etc.—is to combine images in interesting ways. Whether you’re crafting a surreal piece of art or swapping heads, the process is similar in each program. 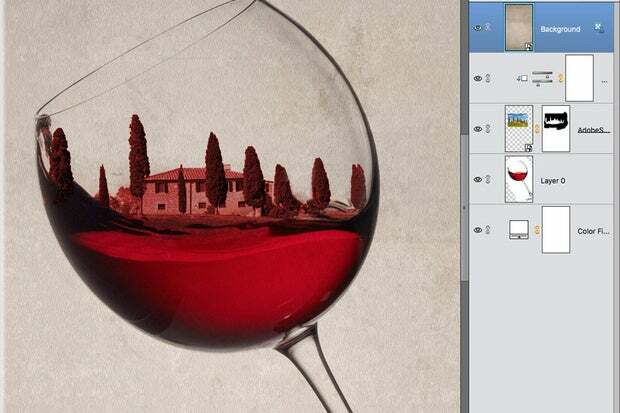 In this column, you’ll learn how to use Photoshop Elements to combine a photo of an Italian villa and a glass of red wine in order to create a version of Italy you can drink. Fire up the Elements Editor and click the Expert button at the top of the workspace. 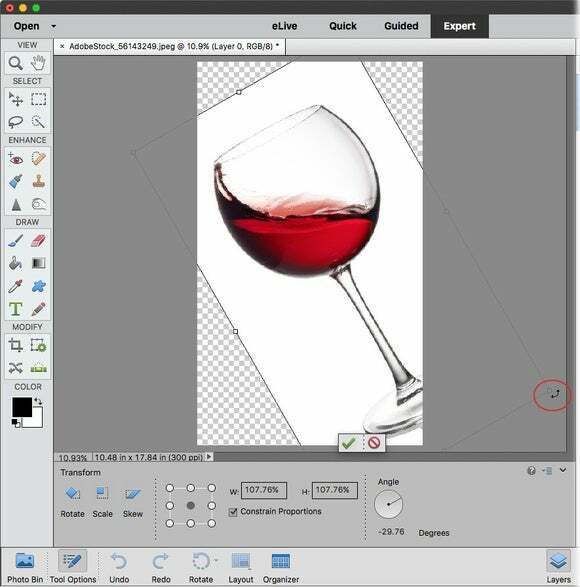 Choose File > Open and locate the image you want to base the composite on, such as the wine glass shown here. Summon the Layers panel by clicking the Layers button at the bottom of the workspace. If the image needs rotating, choose Image > Transform > Free Transform. Point your cursor near one of the corner handles and when it turns into a curved arrow (circled), drag to rotate the image to your liking. To reposition the image, click and drag inside the box. When you’re finished, click the green checkmark beneath the image to accept the transformation (or press the Return key on your keyboard). Add another image to the document by choosing File > Place. Navigate to where the other image lives on your hard drive and click Place. When the image opens, Elements surrounds it with resizing handles. If you need to resize it, peek in the Tool Options panel and make sure Constrain Proportions is turned on, and then drag any corner handle to resize the image. Drag within the box to reposition the image if necessary. Click the green checkmark beneath the image when you’re done. 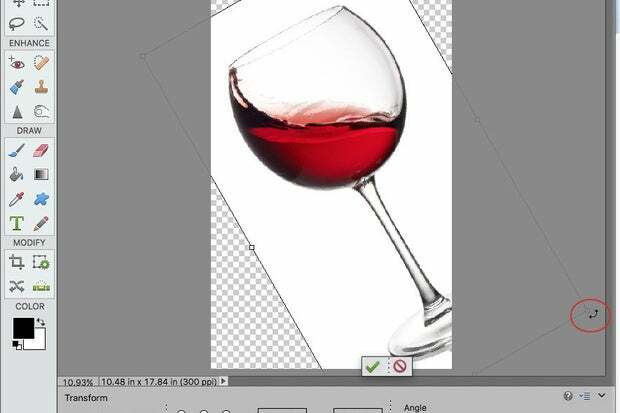 To hide a portion of an image you can use a layer mask. In this example, we’ll hide the sky in the villa image. Sometimes it’s easier to select what you don’t want and then invert the selection in order to select what you do want. With the proper layer active, grab the Quick Selection tool from the Toolbox (circled). In the Tool Options panel, adjust brush size and turn on Auto-Enhance (also circled). Mouse over to the image and click, or click and drag, across the area you want to hide (the sky). The size of the area Elements selects is directly related to your brush size. If you select too much, Option-drag across that area to subtract it from the selection. Flip-flop the selection by choosing Select > Inverse and then add a layer mask by clicking the circle-within-a-square icon at the top of your Layers panel. When you do, Elements hides the selected area. To adjust the color of one layer so it looks more like the other layer, click the half-black/half-white icon at the top of your Layers panel (circled) and choose Hue/Saturation. In the panel that opens, turn on Colorize (also circled) and then adjust the Hue slider to your liking. You can also use the Saturation slider to adjust color intensity. To restrict the color change to one layer down, click the icon at the bottom left of the panel (it’s circled, too). Now the color change only affects the villa layer. You can also use layer blend modes to control how colors on each layer blend or cancel each other out. To make as much of the grassy foreground disappear as possible, activate the villa layer and from the menu at the top of the Layers panel, choose a different blend mode. Darker Color was used here as it looks at the colors on all layers and keeps only the darkest ones; it doesn’t blend any colors together. 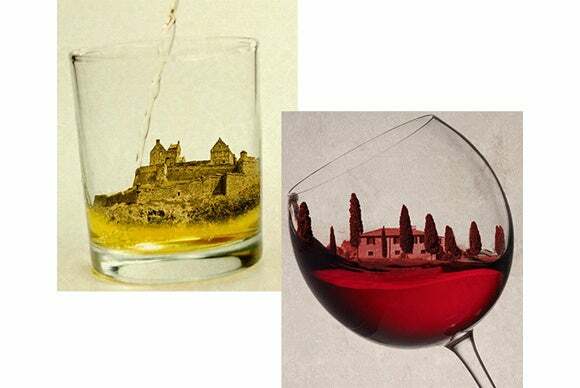 Since the wine is darker than most of the foreground, a chunk of it disappears but that’s easy to fix. Click the mask you created earlier (circled) and activate the Brush tool in the Draw section of the Toolbox. Take a peek at the color chips at the bottom of the Toolbox (also circled) and press D to reset them to the default values of black and white, and then press the X key to flip-flop them so that black is on top. In the Tool Options panel, pick a soft-edge brush from the Brush menu, adjust brush size, and then set opacity to 100 percent. 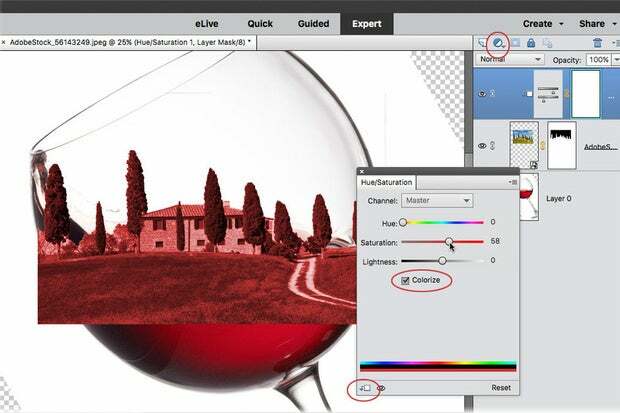 Mouse over to the image and brush across the areas of the image that you want to hide. If you mess up and hide too much, press the X key to flip-flop your color chips so that white is on top and then brush back across that area. Remember, in the realm of the layer masks, painting with black conceals and white reveals. Texture is a great way to make multiple images look like they go together, and Elements has a slew of textures built into the program. To access them, click the Graphics button at the bottom of the workspace and scroll down until you find one you like (“Oh So Dusty” was used here). Single-click a thumbnail to download and add it to your document. Click the Layers button at the bottom of the workspace to reopen your Layers panel. Locate the texture you added and then drag it to the top of your layer stack. Use the menu at the top of the Layers panel to change the texture layer’s blend mode. If the texture seems too dark, ensure that layer is active and then adjust the Opacity setting at the top the Layer panel. In this example, doing so reveals a couple of empty corners in the document created by rotating the image earlier. To fix that, click the half-black/half-white circle at the top of the Layers panel and choose Solid Color. In the Color Picker that opens, pick white and then click OK. Drag the fill layer to the very bottom of your layer stack. If you’re happy with the composition, great. If not, continue adjusting color by double-clicking the Hue/Saturation adjustment layer’s thumbnail to reopen the Hue/Saturation panel and/or experimenting with different blend modes for each layer. Here’s the final piece along with the Layers panel. As you can see, compositing takes time but the results can be well worth the effort. Until next time, may the creative force be with you all!